What a great trip. We pulled in to the farm at about 8 PM and unloaded the new boys. They're in their own pen adjacent to the big boys' pen - there was a lot of nose-sniffing through the fence. The new boys are so small next to the JRF crew. And white! Especially in the waning daylight, they looked so etherial. They had been understandably upset during the trip, and worried us a little by not drinking anything the whole way, but arrived no worse for the wear. I called Ann M. to let her know her boys were fine and settled into their new home. was a lot of fun, and we had a great time visiting with family we don't get to see very often. It was just a short visit - wedding, cookies and punch, kiss-kiss, and off we go again. My niece has become my Facebook buddy, so we enjoyed spending some face-to-face time. She's so darned grown up. I was holding up pretty well at the actual wedding ceremony until my nephew marched out with his groomsmen, turned to the congregation and looked down the aisle for his bride. He looked JUST like my dad as a young man. Waaaahhhhh. Tissue time. My sister and her mother in law had gorgeous dresses.. all blue and sparkly. The bridesmaids were in satin red dresses - very dramatic. Weddings sure are fun. 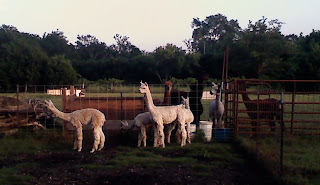 Then it was off to Auxvasse, MO to Ann Mayes' house for the alpacas. She and her mom, Mickie, each have a small house on the property, with the barns and pastures and alpacas in the back. The Missouri weather was much cooler than Texas, and the tour of her farm refreshed us after a long drive. We met the girls, penned up close to the house. She's got a week-old cria who needed lots of extra care after her birth. The little babe managed a baby spit at Ann as she picked her up. Whoa! Smarty pants! The boy alpacas lived in another paddock, guarded by two brother Great Pyrs - Snow and Ice. Though fierce to intruders, they were very luvvy with us. serious fiber discussion, handling, planning, and, um, purchasing. Ann is overrun with neck fiber so she sold me a bunch really cheap to get it out of her house. I'm thinking rug yarn. Or roving to be crocheted into rugs, like Ann did. Those rugs are very nice. 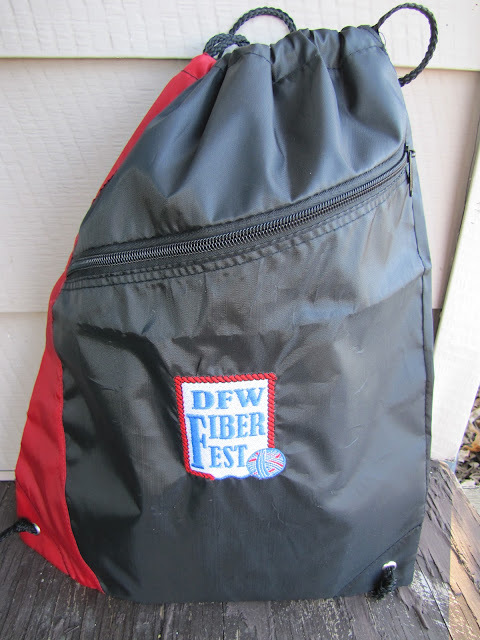 We could have talked about and played with fiber for days on end. Ann's mom, Mickie is a great cook, and we loved her roast and vegetables dinner and her breakfast casserole this morning. We've not lacked incredible food since we started our adventure. There's more to share, but it's time to turn in. I'll have more Suri pictures tomorrow. I'll need to stare at them for several hours, I think. Welcome Home, EVERYONE!!! The Suri boys are more than gorgeous! Great job, ladies, and thanks for all the updates. I sure enjoyed Emma's blog. You go, Emma! Ooooooo the alpacas look wonderful! Glad you had a great trip and are home safe and sound! It is amazing when we see our family members in the younger generation, isn't it?